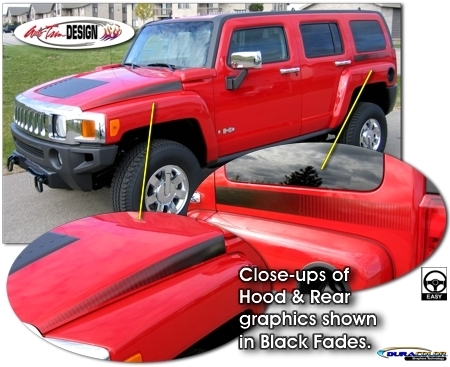 Dress up your H3 or H3T with these great-looking body side graphics. They are simple, unique and they'll set your vehicle apart from the rest. Hood and Rear graphics feature a unique fading "strobe" design. Graphic kit is precut, easy-to-install and requires no trimming. Available in a variety of fade colors, graphics are packaged with one (1) Driver Side and one (1) Passenger side graphic set.